Summary: 'Tis the season to get Pink! Lauren Willig's beloved Pink Carnation series gets into the holiday spirit with this irresistible Regency Christmas caper. I have always been intrigued with The Pink Carnation books by Lauren Willig, and I've wanted to read them because they sound like books that I might enjoy. The problem is that I like to read series in order and six books in this series have already been released (with more to come in the near future.) I find it daunting to go back and start at the beginning, but on the same account, I would like to give these books a try. Such a dilemma! So in my effort to branch out in my reading (and that means trying new things like reading books out of order), I decided to give THE MISCHIEF OF THE MISTLETOE: A PINK CARNATION CHRISTMAS a try. I figured it I didn't just jump into the series, I might never get around to reading them. Plus I heard that this novel works as a standalone. I have to say that I found THE MISCHIEF OF THE MISTLETOE to be a very entertaining read. It was light and funny and absolutely perfect for holiday reading. I'm not sure what I was expecting when I picked up this novel except to say that it looked like a historical fiction book, but I have to say that I was a little surprised. THE MISCHIEF OF THE MISTLETOE was part spy novel, part romance book and part mystery; and I found it to be a delightful combination. I was most surprised by just how funny this book was. The characters were definitely "characters" (especially Turnip and his sister) and their actions were hilarious. I'm not a big fan of romance books, although I think I make an exception for Christmas books (I guess I get all sentimental this time of year.) However, I really enjoyed the romance parts of this story. The romance scenes were very light-hearted and the characters were extremely likable, so I found myself wanting them to fall in love (and realize each other's feelings.) I especially loved the banter back-and-forth between Arabella and Turnip. I should probably admit that I enjoyed the mystery aspects of the story a little bit more than the love scenes (but that's just me.) However, I thought the author did a great job of playing each of these components off of each other. There was just the right amount of love and suspense to keep the flow of the book moving. THE MISCHIEF OF THE MISTLETOE was action-packed and suspenseful and kept me guessing right up until the end, although I wasn't really trying very hard to figure out the mystery. As far as whether THE MISCHIEF OF THE MISTLETOE works as a standalone novel...I think it does. In fact, I found myself wanting to explore more of Ms. Willig's novels because some of the secondary characters in THE MISCHIEF OF THE MISTLETOE were so interesting. What I really appreciated was that Ms. Willig included a note about the Pink Carnation Series in the back of the book. It gave some insight into the history of the series which, as a new reader, I found very helpful, but it also gave some information about where the story fits into the series for seasoned readers. I especially appreciated that there was a list of characters which not only explained their roles in THE MISCHIEF OF THE MISTLETOE but also referenced what other books they appear in. If you are looking for a cute read during this very busy time of year, then I suggest giving THE MISCHIEF OF THE MISTLETOE a try. I can almost guarantee that you will fall in love with the characters and get quite a few laughs in the process. Note to all of you Jane Austen fans out there: Jane actually makes a cameo appearance in this novel! Giveaway alert: Thanks to the publisher, I have two copies of THE MISCHIEF OF THE MISTLETOE to share with two lucky readers! 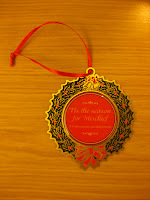 In addition, the winners will receive a lovely Christmas ornament to go along with the book. To enter, just fill out the form below -- that's it. This contest will be open until November 10th at 11:59 p.m. ET, and I will notify the winners the following day. Open to those of you with U.S. and Canada mailing addresses only. Good luck! I completely understand about reading series in order. I sometimes think I'm a little OCD about it but I'm trying to break the habit and this was one of the books I was looking at to start a new trend. I love anything to do with Christmas and this sounds like a fun book to start a new series with. I haven't read a lot of romance novels but, your review (and it is a Christmas story) makes me want to give it a try. Plus, how can you not love a Jane Austen cameo? Like you, I've been interested in trying this series, but haven't gotten around to it. Thanks for mentioning that this works as a stand-alone novel. And I appreciate knowing that there will be a character list. Hoping for a win! Thanks. I like this series - I find it's actually improved significantly as it's gone along. The romances in the beginning sort of detracted from everything else, but she's achieved a nice balance now. I'm glad to hear this one is still going strong! Thanks for the chance to win a copy - I'm crossing my fingers. I'll be going home around Christmas and this will be the perfect read. I'm glad this one works as a standalone. I've read the first three but never got around to the fourth. I may just start up again with this one because I have it! This book sounds lovely. I am already setting my sights on holiday books to satisfy me through Christmas. Thanks for the review and for the awesome giveaway opportunity! Whee! I think I tolerate some romance in my books this time of year because life gets so hectic it's nice to have some predictability. I too have always wanted to read the series and feel as if I'd never catch up. Glad this one made you want to read more. This sounds cute. I haven't read any of them, but it's nice to know it can stand alone! I just found your website - this is great. I chose the first Pink Carnation book as a book club book years ago, but it wasn't until last year that I decided to catch up on all the others. I actually ended up buying all the books on audio book - the woman who reads it is fantastic. They are really great to listen to - hugely entertaining. Anyways - I can't for the Christmas book because it is featuring "Turnip Fitzhugh" who is kind of a scene stealer. I'm reading this book right now and - so far - I live it! The characters are fun and quirky and there's a nice little romance brewing between Annabella and Turnip. I'm not a fan of espionage, but this book doesn't focus heavily on the spy stuff. Really good stuff - can't wait to read the rest of the books in the series!